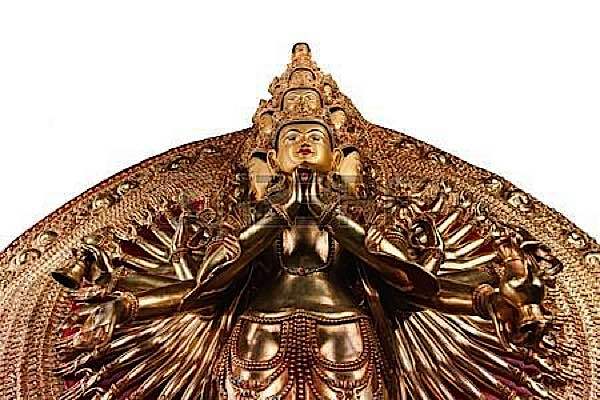 Around the world, millions of Mahayana Buddhists chant the Maha Karuna Dharani, the Great Compassion Mantra of Avalokitesvara (Chenrezig, Guanyin) — famous for its benefits of healing, protection and purification. It is probably the second most chanted mantra, after Om Mani Padme Hum — which is a short mantra of Avalokitesvara. It is also among the most beautiful to listen to both in tonality and expression. 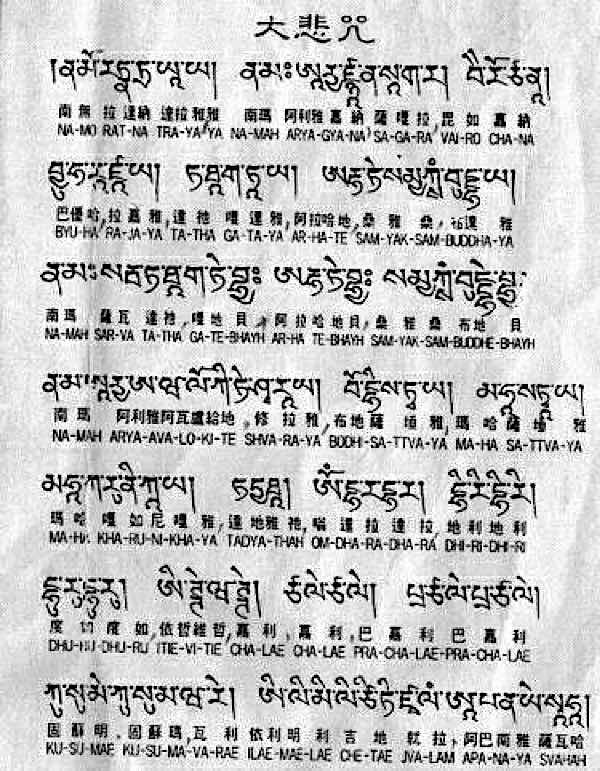 Despite its intimidating length of 84 lines (there’s also a short version), which is long in terms of a Dharani or mantra, it is sung daily by many devoted followers of the Compassionate Buddha. 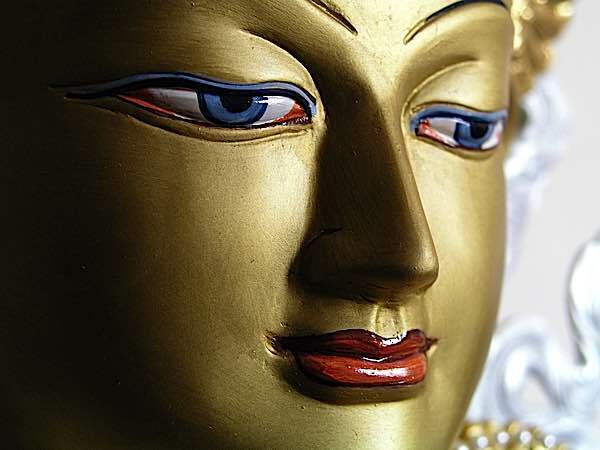 The very face of compassion, Metta personified in glorious Avalokiteshvara, the compassionate Buddha. A Dharani is generally held to contain the essence of the entire Sutra in which it is cited, in this case the sutra of the Maha Karuna Dharani Sutra, but is not meant to be literally translated (even though we do so below.) It is meant to transform us at a more profound level than can be conveyed with simple words. Why is it so popular, aside from intrinsically lovely lyrics and beautiful musicality. For one, it is of immeasurable benefit to all sentient beings. 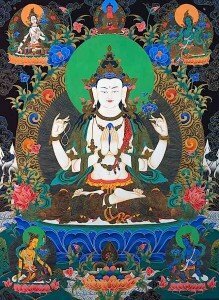 It is the very core of Avalokiteshvara’s compassionate mission. The immediate benefits, as taught in sutra and commentaries, are: purification of negative karmas, protection and healing. They will always obtain the help and respect of others. They will always have the necessary goods and wealth in abundance. 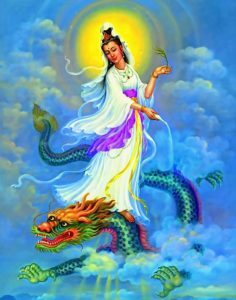 Beautiful Guanyin, the feminine face of Avalokiteshvara’s compassion. 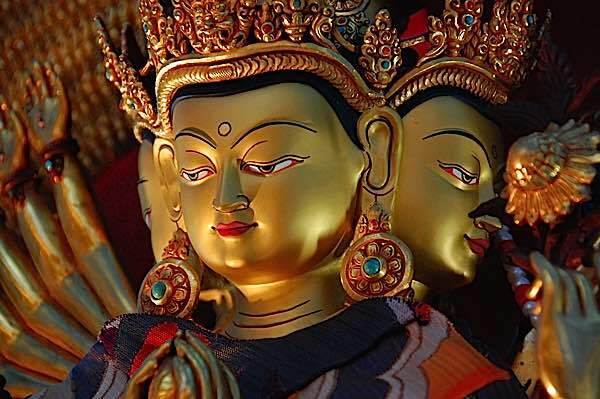 The wonderfully peaceful and loving face of Chenrezig – Guanyin – Avaolokiteshvara. Just meditating on the face of compassion brings peace. On Chenrezig’s crown is Amitabha, His spiritual father. It is most often sung or spoken in the original Sanskrit, rather than the available English, Thai, Vietnamese, or Chinese translations. The translations tend to be for those compelled to delve into the “word meanings”, but as always with mantra, the word meanings are not that important. Sankrit is a language of Holy syllables, where not just words are formed, but sacred sounds that have layers of meaning. For this reason, the Great Dharani Mantra should be chanted in Sanskrit. For reference, though, there are different translations and versions (short and long). The kind face of loving Guanyin, the female aspect of Avalokiteshvara, Goddess of Compassion. 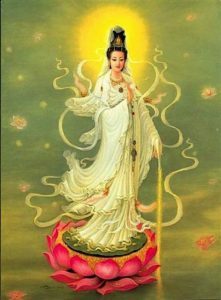 Beautiful mother Guanyin is one feminine aspect of Avalokiteshvara. Four-armed aspect of Chenrezig, Lord of Compassion. 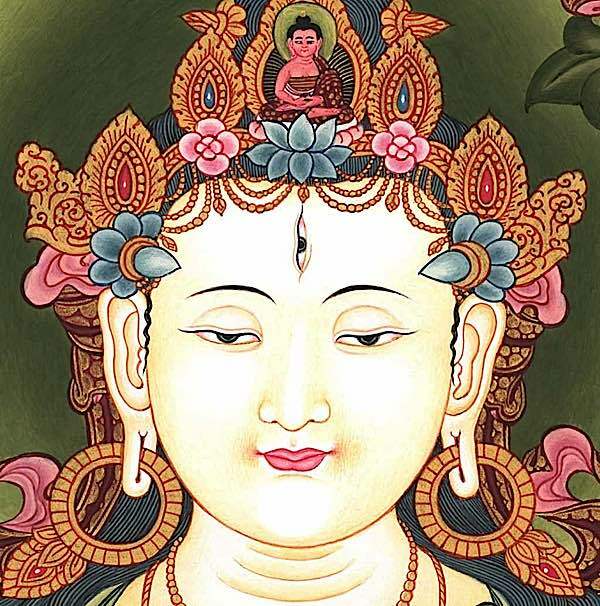 Chenrezig (Avalokiteshvara) is the Buddha of Compassion. My Lord, appear unto me. To You who sees our all, Namo. To the Great Lord, Namo. To the Great Lord in Yoga, Namo. To my Lord, Namo. To the Varaha*, Namo. Adoration to the Triple Gem. Adoration to the noble Avalokitesvara bodhisattva, Namo. banners were hanging all around. Princes who had been empowered through their crowns (Abhiseka). ground, gods of mountains, gods of rocks, gods of palaces, and so on. 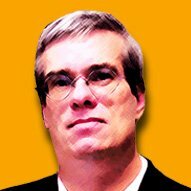 great-thousand worlds system, were all illuminated and became golden. to comfort and please all living-beings, he secretly emits such great sacrosanct power. evil paths, I vow not to achieved the Correct-Awakening. be reborn in any Buddha-World, I vow not to achieve the Correct-Awakening. obtain unlimited Samadhis and eloquence, I vow not to achieve the Correct-Awakening. doubt, her wish will not be satisfied. A thousand arms of compassion. 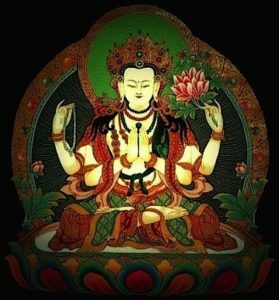 The 84 aspects of Avalokiteshvara’s compassion is celebrated in the great Dharani, including the thousand-armed Chenrezig aspect — a 1000-arms of compassion reaching out to benefit all sentient beings. resolve to save all living beings and help them to achieve the Correct Awakening). 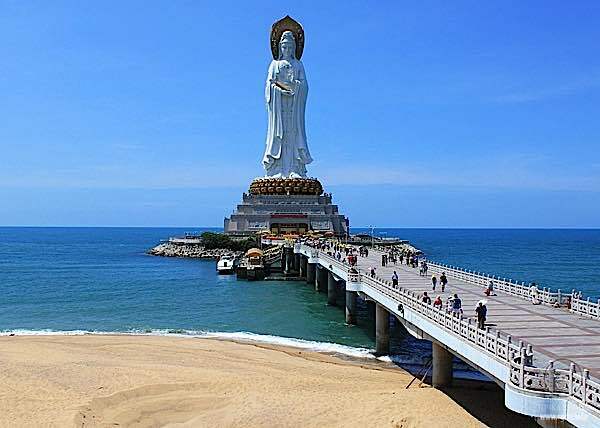 palms respectfully, and said to Avalokitesvara Bodhisattva: “How virtuous, Mahasattva! neck. This Mantra has been spoken by previous 9.9 billions Ganges-river-sands Buddhas. 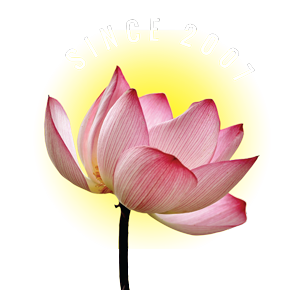 Buddhahood, with the thirty-two marks and the eighty minor marks achieved naturally. unsurpassed Bodhi-Hearts [by the power of this Dharani]. on the ground with the threads as a boundary. kalpas before, he had already been a Buddha named True Dharma Brightness Tathagata. should keep reciting a Buddha’s name, mix the powder with white honey or human milk. bed of the patient, then the possessing ghost will run away and not dare to stay. Dharani 49 times towards them, smear some ghee and honey on them, and burn them up. should use the Moon-Quintessence Mani Mudra. For eliminating evil obstacles and misfortunes of one’s body, use the White Whisk Mudra. womb, use the Nirmana-Palace Mudra. 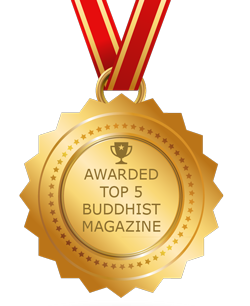 and award you the mark of future Buddhahood, use the Summit Nirmana Buddha Mudra. human beings, dragons, spirits, should accordingly rejoice when hearing my praise. respectfully and started practicing it.